is it just for leeds? Worked for me, sending a parcel from North London area to the West Midlands. Typed LEEDSHERMES into the coupon code and it deducted £2.29, which is the cost of a small parcel with no extras. Good deal then if it's working for all. Got some ebay items ending soon will you be able to use it more than once ? Good deal then if it's working for all. Got some ebay items ending soon … Good deal then if it's working for all. Got some ebay items ending soon will you be able to use it more than once ? Is it online only ? as if i went to the parcel shop could i do it in store with the code nothing in the website about this . I was thinking set up extra accounts for the discounts or do it online and instore . You can't ever do it in the parcel shop, I'm afraid, it has to be online so that you can print out the address label with barcode. Do it with different accounts. They say in their t&c's that you can only have one account, but that is ridiculous, I need to keep my ebay accounts seperate to link them to the myhermes import service, so have one for each of 3. Does no-one any harm. Used going from Greater London to Bradford :o) Had to pay £3 for larger size and cover but still a great saving, thank you. Just checked my hermes account and I have sent 435 parcel with them, approx 5 had issues, most of those 5 I was fully refunded for the item and the postage. Royal Mail I have sent about 25 parcels, approx 5 of those had issues, RM refused to pay out for all but 1 of those. So I would have to say, as poor as Hermes are with some things they have a far higher success rate for me then royal mail. Thanks OP you just saved me £2.79, have some heat. Going HOT HOT HOT with this mega free DEAL!!! can I send my mother in law to Timbuctoo? Used going from Greater London to Bradford :o) Had to pay £3 for larger … Used going from Greater London to Bradford :o) Had to pay £3 for larger size and cover but still a great saving, thank you. Knack it saved me the small parcel fee which was £2.79 from hermes website. I ended paying only 60p which was the extra for the protection of upto £40. Hope it helps. Just checked my hermes account and I have sent 435 parcel with them, … Just checked my hermes account and I have sent 435 parcel with them, approx 5 had issues, most of those 5 I was fully refunded for the item and the postage.Royal Mail I have sent about 25 parcels, approx 5 of those had issues, RM refused to pay out for all but 1 of those.So I would have to say, as poor as Hermes are with some things they have a far higher success rate for me then royal mail. The big problem I find with Hermes is they use contract drivers. Where I am, these drivers are absolutely rubbish, where my mate is 50 miles down the road, they seem fine. It took them 3 attempts to deliver a CD to my work address - there's 200 people in here and they had the cheek to say there was nobody available. Then they tried delivering it at 9pm on a Saturday night (despite knowing it was a commercial address) and finally they managed to find the letterbox on the Monday. Unfortunately for them, we are a CCTV company and have cameras all round the building. They hadn't showed either the Friday or the Saturday despite the alleged missed delivery notifications. That's just one example, I've had others. They strike fear in my heart when I hear a package I'm waiting for is with them. I've similarly got 500+ on eBay and use Royal Mail all the time, but I've only ever had 1 package go missing with RM. And despite having to wait many weeks to get them to send me compensation, it was paid without dispute. In my experience Hermes are good , sent 3 parcels (2 big) all received quickly . Received a lot more here at home and the woman whose round it seems to be is excellent . Lot of competition out there so they have to be good . Royal Mail are very good too . when will this expire please? **Code must be redeemed within two weeks. Knack it saved me the small parcel fee which was £2.79 from hermes … Knack it saved me the small parcel fee which was £2.79 from hermes website. I ended paying only 60p which was the extra for the protection of upto £40. Hope it helps. Just had £200 worth of stuff stolen by these guys so i can't vote hot. only use them or collect+ if you got a digital receipt even if its not for what you sent so you can claim collect+are good on compo.i mainly use these firms to (collect+) to send xmas heavy boxes for the family and only do it store to store. Free is too expensive for Hermes. is this only for certain value and in the UK parcels? Have to agree... Royal Mail are awful and Hermes though do have some issues they are quickly resolved. Is it international parcels free also? Do not use this company, my parcel was tracked to my local depot then to the (contracted) driver - who went missing! It is near impossible to get to speak to anyone and they won't allow you to collect from the depot. I was told so many lies, saying they tried to deliver (but no card was left & I was in at the times stated!) I would prefer to pay the royal mail. Sent about 50 parcels with them last 12 months - not one issue (commentator error??). lol. free or discounted, it will still be chucked under your hedge, left out in the rain, or be stolen by garden gnomes. 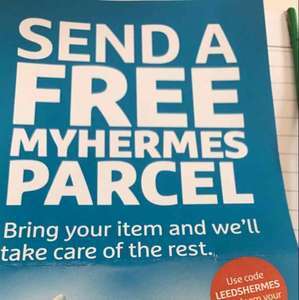 I'd not use myhermes by choice even if they paid me, never mind free. Deal posting newbie! This is proutnathan first deal post. Help out by leaving a posting tip or just to show your appreciation for their contribution.